Exuberance, defiance, celebration and ribald wit all come together on the emotional roller-coaster ride that is a Burning Bush performance. 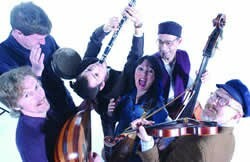 Combining foot-tapping Klezmer, exotic Arab-influenced dance music from the old Ottoman world and haunting, mystical ballads of the Jewish ghetto, Burning Bush crosses cultural boundaries with uninhibited brio in music and song both timeless and topical. Featuring the amazing voice and sinuous violin of Lucie Skeaping and the breathtaking virtuosity of clarinettist Ben Harlan, this multi-talented band presents music that is impossible to resist whatever your background, as audiences from Zagreb to rural Wiltshire will confirm. A magical journey into nostalgia, hope and joy.